Just outside the village of Malaucene this is a perennial favourite . Run by Ophélie and Marc Girard ( Marc is Chef), very ably assisted by Ophélie’s sister, the Pont de L’Orme is a very well run family business in a gorgeous setting – an old Mas with extensive gardens and a majestic tree lined drive on the approach. The restaurant serves Provencal classics with flair and an accent on precise flavours, fresh in season produce, and wonderful presentation. To die for Fois Gras, Duck, Pigeon, Lobster, Scallops and Charrolais steaks are regular features on the menu. In the summer the terraces surrounding the house offer a romantic al fresco dining ambience. Has become our default choice with tour guests for a great night out. This is just five minutes from La Madelène in the picturesque village of Entrechaux. Owned and operated by the same family, the Mourets, since 1929. Two big rooms with wood panneling, wisteria covered terrace, great menu and friendly service. Specialises in game dishes in season and a good selection of fish is always available. Specialities include civet de lievre or biche ( hare or female venison), a classic provencal beef daube, served in individual pots, terrine of sanglier ( wild boar) , assiette des fruits de mer ( shell fish platter ) and lobster with a fennil garnish. The service is excellent, the atmosphere informal, many french families of all generations enjoy this restaurant to celebrate fetes, birthdays and the like. 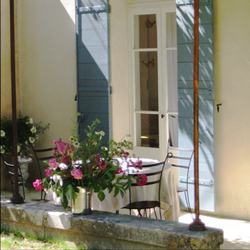 L’Oustalet is provencal for “small house”. 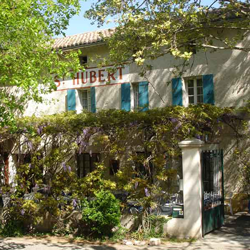 Located on the edge of the beautiful village square, under the majestic Dentelles de Monmirrail, this elegant restaurant is owned by Gabriel Meffre , the well known negociant and owner of estate Domain de Longue Toque. His chef is the talented Cyril Glemot. 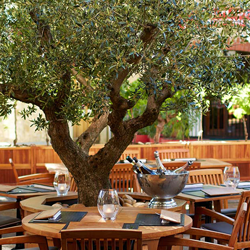 You can eat al fresco in the summer and enjoy their refined approach to Provencal classics accompanied by a choice of Gigondas wines from pretty well every producer in the appellation as well as other local Cotes du Rhones. Recent specialities include Duo de foie gras with a Beaumes de venise marmalade, roast pigeon, turbot with cannelloni, and for dessert an eclectic collection of 4 small dishes concocted from black olives, including ice cream : “Variations aux olives noire”. The setting of this restaurant, just beneath the ruin of the Pope’s summer palace, as well as a terrace with a 360 degree panoramic view of the Rhone river down to Avignon, the Chateauneuf vineyards and the Dentelles/Mt. Ventoux to the west is to die for, never mind the food. In fact rest assured, the latter is well up to standard – the emphasis is on ingredients rather than presentation and so much the better for that. Recent “Menu de Verger” options have included excellent fish – dorade. lotte and dos de cabillaud. Naturally the wines of the villlage play a leading role , around 50 different producers, a few older vintages and always a Chateauneuf of the day , either red or white available by the glass.